UNITED NATIONS, July 2 -- Uganda still has "scouts and intelligence people" working with the army of the Democratic Republic of the Congo, six months after their ill-fated joint action against the Lord's Resistance Army, Ugandan Permanent Representative to the UN Ruhakana Ruganda told the Press on July 2. Ambassador Ruganda, as the Security Council's rotating president for July, affably took four questions from Inner City Press, two about the LRA, one about Kenya and another about the recently disbanded UN Mission in Georgia, a vote on which Uganda abstained. Surprisingly, Ruganda described the joint DRC - UPDF action in December 2008 against Joseph Kony's LRA as a "positive thing" that "liberated captives." Video here, from Minute 36:02. Most observers called it ill-conceived, in that once Kony got away, the LRA slaughtered scores of Congolese civilians. 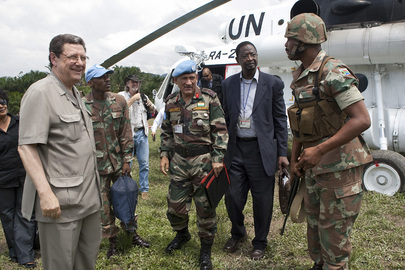 It is said that the UN Mission in the Congo, MONUC, was told about the operation only moments before it began. Inner City Press asked Ruganda about his quoted statement that he will use his month as Council president to vigorously promote such "regional cooperation." 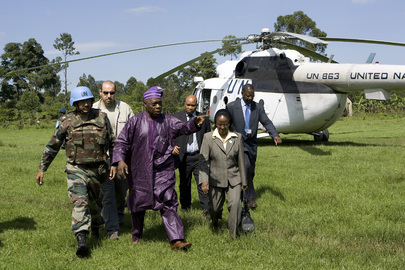 Ruganda answered first about the Hutu rebels partially repatriated from DRC to Rwanda, 500 of whom he said the Council visited during its recent mission to the region. What Ruganda did not say is that the remaining FDLR in the Kivus are now killing villagers in retaliation, as denounced July 2 by Human Rights Watch. On disbanding the UN's Mission to Georgia, on which Uganda voted with China, Vietnam and Libya, Inner City Press asked if the Council will at least still monitor the mission of past and present envoy Johan Verbecke, whom Ban taps to continue to participate at the Geneva talks involving Russia and Georgia. Video here, from Minute 22:04. We haven't discussed that very specific question, Ruganda answered. Sources tell Inner City Press that Verbecke's Georgia gig will soon terminate, as he'll be named Belgium's Ambassador to the UK. When Inner City Press asked about the long-delayed briefing to the Council about Kenya, called for in the Council's own February 2009 Presidential Statement, Ruganda opined that "I don't think the Security Council should be involved in everything." Video here from Minute 39:02. 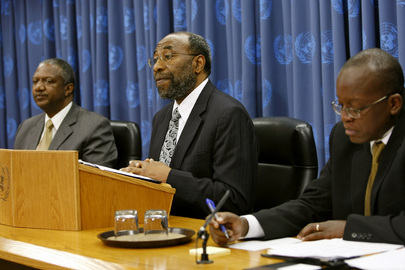 But the Council issued statements on Kofi Annan's mission, and called for his report. Some say that because the UK and US took different sides in Kenya -- and because Ban Ki-moon does not like to be compared with Kofi Annan -- the called for briefing will never take place. Even though Annan has now set an August deadline for Kenya to try suspects for inciting violence at the time or he'll refer them to the International Criminal Court, Ruganda's answer makes it appear that for all these reasons, the Council will not revisit Kenya. Just as the Council never officially put Sri Lanka on its agenda, despite tens of thousands killed there. Still, Ruganda's affability portend a more open Council month in July. Watch this site.